This morning I started out by making the apricot glaze which was required to then make raspberry glaze. First I used about 10 ounces of apricot jam from my stash and mixed it with some water and boiled it. When it was thick I added corn syrup and strained it to make apricot glaze. Then I added an equal amount of puréed fresh raspberries and this was then ladled onto the cakes. They went back into the fridge to set. That took a long time, particularly on the larger cake. I think the glaze layer was thicker and that's why. This afternoon I melted some chocolate and decorated the cakes. First I got to use the torch to remove the rings and then suffered the consequences of the glaze not being fully set. (The glaze ran down the sides a bit.) Ultimately, I think the decorating came out fairly pretty. 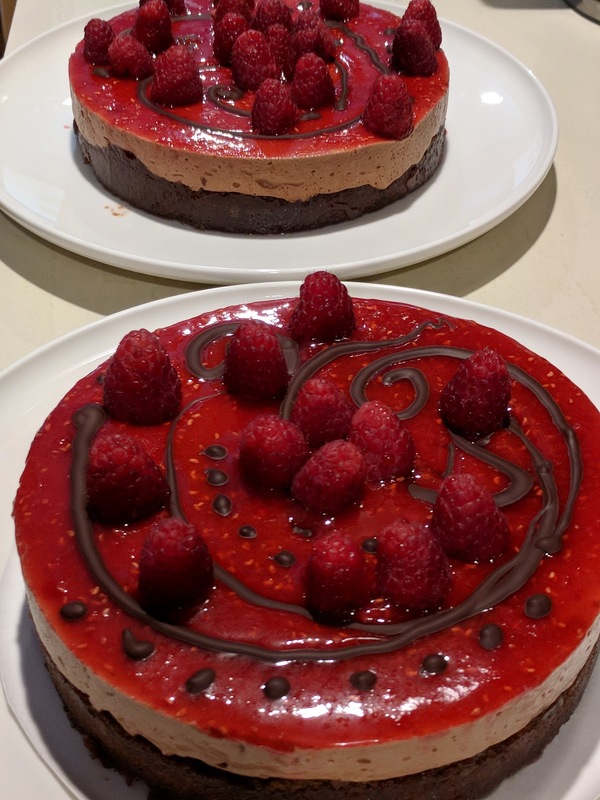 I didn't make little chocolate "duck feet" like we'd been taught in class; just some dots and swirls and then topped the cakes with raspberries. 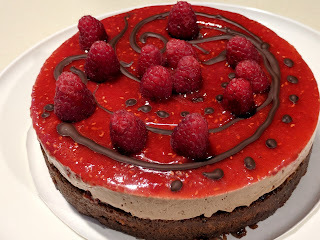 An absolutely lovely cake, both in looks and taste! Enjoyed by all. Many thanks, D.